Apart from the Centre’s nod to CBI inquiry, the Supreme Court on Monday said that it will hear the plea seeking an investigation against the alleged leak of examination paper for the combined graduate level exam - SSC CGL tier 2 on March 12. Relenting to the pressure from agitating students, the Modi government on Monday ordered a Central Bureau of Investigation (CBI) inquiry into the alleged leak of SSC CGL Tier 2 examination held between February 17 and February 21. “We have accepted demands of protesting candidates and have given orders for a CBI inquiry, protests should now stop,” news agency ANI quoted Home Minister Rajnath Singh as saying. 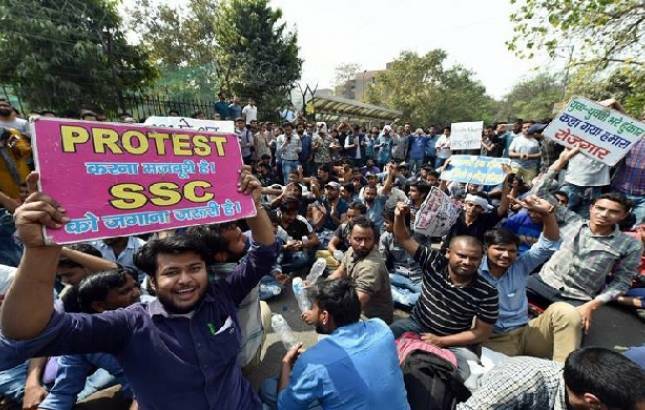 Thousands of students were holding massive protests against the leak of SSC-CGL Mains examination paper outside the Staff Selection Committee headquarters at Lodhi Road in New Delhi. Congress MP Shashi Tharoor, who was supporting the protesting students also confirmed the positive development. “Spoke to (Jitendra Singh) in Parliament today. He has agreed to a CBI inquiry on all the SSC-CGL Mains papers (leak, conduct of exams etc). I thank him for his willingness to listen to these legitimate demands (with) an open mind,” Tharoor tweeted. “I trust the word of @DrJitendraSingh who has approached the issue constructively throughout. He acted on my tweets, calls & personal emails even on a Sunday,” the Congress MP said in another tweet. Earlier on Sunday, speaking exclusively to News Nation, the Staff Selection Commission (SSC) Chairman Aseem Khurana agreed to recommend a CBI inquiry into the alleged paper leaks in one of its tests held on February 21. “We are ready for the CBI probe. There is no evidence against us. The entire protest is sponsored by coaching institutes whose scam has stopped after our decision to hold the exam online,” Khurana said. Earlier in the day, anti-corruption crusader Anna Hazare had also joined the SSC aspirants who were holding protests outside the SSC headquarters.